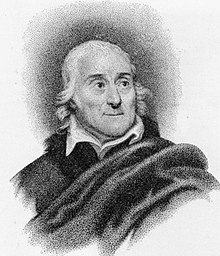 Lorenzo da Ponte (10 March 1749 – 17 August 1838) was an opera librettist and poet. He is best known for having written the libretti for three of Mozart's operas, The Marriage of Figaro, Don Giovanni, and Così fan tutte. Da Ponte was born Emanuele Conegliano to Jewish parents near Venice, Italy. He became a Christian, and took the name Lorenzo da Ponte from the bishop who baptized him. He was became a priest at the church of San Luca in Venice. He took Anzoletta Bellaudi as his mistress. They ran a brothel. Da Ponte was banished from Venice for 15 years. He went to Austria where he became court librettist to Emperor Joseph II. About 1792, da Ponte married Ann Celestine Grahl. They had four children. When Joseph II died, da Ponte lost his job. He went to London. He got into debt, and went to the United States. He ran a grocery store in Pennsylvania for a short time. He moved to New York City and opened a bookstore. He became the first professor of Italian literature at Columbia College. He produced Don Giovanni in New York in 1826. In 1828, da Ponte became a naturalized US citizen. Da Ponte died in 1838 in New York. His funeral was held in New York's old St. Patrick's Cathedral. His final resting place is uncertain. All of da Ponte's libretti were adaptations of pre-existing plots, except L'arbore di Diana and Così fan tutte. His adaptations are of the highest order. The Don Giovanni character was given new life in da Ponte's hands. The character is now considered the archetypical libertine. "Lorenzo Da Ponte". Catholic Encyclopedia. New York: Robert Appleton Company. 1913. This page was last changed on 20 February 2019, at 03:11.